Working with RDF and URIs can be annoying because URIs such as „http://purl.org/dc/elements/1.1/title“ are long and difficult to remember and type. Most RDF serializations make use of namespace prefixes to abbreviate URIs, for instance „dc“ is frequently used to abbreviate „http://purl.org/dc/elements/1.1/“ so „http://purl.org/dc/elements/1.1/title“ can be written as qualified name „dc:title„. This simplifies working with URIs, but someone still has to remember mappings between prefixes and namespaces. Luckily there is a registry of common mappings at prefix.cc. This posting has also been published at blogs.perl.org. The application is called paia – that’s how it called at command line and that’s how it is simply called as function in the tests. The wrapper class (here: App::PAIA::Tester) creates a singleton App::Cmd::Tester::Result object and exports its methods (stdout, stderr, exit_code…). This alone makes the test much more readable. The wrapper further exports two methods to set up a testing environment (new_paia_test) and to finish testing (done_paia_test). In my case the setup creates an empty temporary directory, other applications might clean up environment variables etc. Depending on your application you might also add some handy functions like stdout_json to parse the app’s output in a form that can better be tested. Probably the best feature of RDF is that it forces you to use Uniform Resource Identifiers (URI) instead of private, local identifiers which only make sense in a some context. URIs are long and cumbersome to type, so popular URIs are abbreviated with namespaces prefixes. For instance foaf:Person is expanded to http://xmlns.com/foaf/0.1/Person, once you have defined prefix foaf for namespace http://xmlns.com/foaf/0.1/. In theory URI prefixes in RDF are arbitrary (in contrast to XML where prefixes can matter, in contrast to popular belief). In practice people prefer to agree to one or two known prefixes for common URI namespaces (unless they want to obfuscate human readers of RDF data). @prefix foaf: <http: //xmlns.com/foaf/0.1/> . @prefix rdf: <http: //www.w3.org/1999/02/22-rdf-syntax-ns#> . If you miss an URI prefix, just add it at http://prefix.cc, and will be included in the next release. Die Tatsache, dass Programme (und damit ist hier der Quellcode gemeint) als „schön“ bezeichnet werden können zeigt, dass Programmieren auch als eine Kunst angesehen werden kann – und die Bühne für Perl ist dabei CPAN 🙂 Übrigens habe ich bislang noch keine schöne kommerzielle Bibliothekssoftware gesehen – aber Bibliotheken geht es beim Erwerb von Software ja auch weniger darum, dass sie etwas schönes und sinnvolles mit der Software anfangen können, sondern darum dass sie die Verantwortung an einen Softwarehersteller abschieben können. Das Modul PICA::Record hat wahrscheinlich nur einen ziemlich begrenzten Anwenderkreis, da das PICA+ Datenformat sogar bei vielen Bibliothekaren eher unbekannt ist. Inzwischen ist wahrscheinlich PICA::Record mit allen Beschreibungen, Tests und Beispielen selbst die umfangreichste Dokumentation zu PICA+. Seit dem Bibliothekstag 2009 gibt es auch eine Kurzbeschreibung als Faltblatt auf Deutsch („Verarbeiten von PICA+ Daten mit PICA::Record„). Die aktuelle Version enthält als neuestes die Möglichkeit, PICA-Daten in einer SQL-Datenbank (bislang: SQLite) zu speichern (PICA::SQLiteSTore) und über ein Wiki (PICA+Wiki) darauf zuzugreifen. Für kommende Versionen ist der Ausbau dieses „CMS-Light“, einer Erweiterung der SOAP-API zum Lesen und Schreiben von Datensätzen sowie eine bessere Unterstützung von Lokaldaten geplant. Sicher gibt es schönere Programmiersprachen als Perl, aber wenn schon mehr Personen im Bibliotheksumfeld programmieren (oder zumindest skripten) lernen – was unbedingt notwendig ist – könnte Perl die richtige Wahl sein, da sich mit PICA::Record bereits nach kurzer Zeit praxistaugliche Ergebnisse erzielen lassen. Zum deutschsprachigen Austausch zwischen Entwicklern im Bibliotheksbereich gibt es übrigens die Mailingliste bibcode. The current issue of Ariadne which has just been published contains an article about the „SeeAlso“ linkserver protocol: Jakob Voß: „SeeAlso: A Simple Linkserver Protocol„, Ariadne Issue 57, 2008. 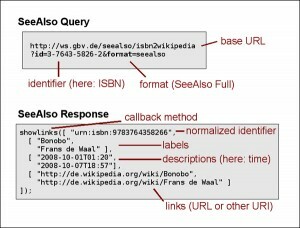 SeeAlso combines OpenSearch and unAPI to a simple API that delivers list of links. You can use it for dynamically embedding links to recommendations, reviews, current availability, reviews, search completion suggestions, etc. It’s no rocket science but I found a well defined API with reusable server and client better then having to hack a special format and lookup syntax for each single purpose. In the documented that I tested there are almost always parsing errors, but better then nothing. I wonder what CiteSeer uses to extract citations? There is more action in citation parsing in the Zotero project – even an IDE called Scaffold to create new „translators“ that extract bibliographic data out of webpages. Another playing ground is Wikipedia which contains a growing number of references. And of course there are the commericla citation indexes like SCI. I thought to use citation data for additional catalog enrichement (in addition to ISBN2Wikipedia) but quality of data seems to be too low and identifiers are missing. P.P.S: ParsCit seems to be a good new reference string parsing package (open source, written in Perl). P.P.S: Konstantin Baierer manages a bibliography on citation parsing for his parser Citation::Multi::Parser. An implementation (SeeAlso Simple and SeeAlso Full) in Perl is available at CPAN (there was neither unAPI nor OpenSearch Suggestions, so I implemented both). 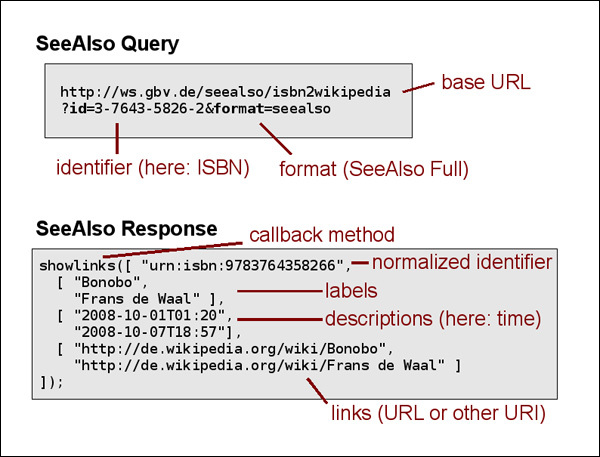 Please note that ISBN to Wikipedia is only one example how the API can be used. 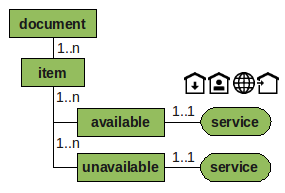 In my opinion the concept of a linkserver is highly undervalued but will become more important again (for instance as a lightweigth alternative to simple SPARQL queries). Feedback and usage is welcome! Wie ich eben in INETBIB schrieb, beginnt der GBV jetzt damit, für seine Kataloge COinS anzubieten. Damit können bibliographische Metadaten einfach aus dem Katalog in eigene Anwendungen übernommen werden. Zu den populären Anwendungen zur Literaturverwaltung gehört das Firefox-Plugin Zotero, welches soeben ein Jahr alt georden und in der Version 1.0 herausgekommen ist. Wie Zotero zusammen mit anderen Social-Software-Werkzeugen und dem Firefox-Abkömmling Flock in eine hocheffizienten Arbeitsplatz integriert werden kann, zeigt dieses Video. Eine anderes Bibliographiewerkzeug, dass COinS unterstützen soll ist Citavi. Das Angebot von Daten via COinS ist wesentlich leichter nutzbar – sucht im im GSO-Katalog einfach mal nach einem Titel und schaut dann im HTML-Quelltext nach der Zeichenkette „Z3988“. Damit das Angebot auch in lokalen OPACs nutzbar ist, sollten meiner Meinung nach die einzelnen GBV-Bibliotheken erstmal selber Zotero ausprobieren und überlegen, wie sie das Angebot ihren Benutzern am Besten bekannt machen können.